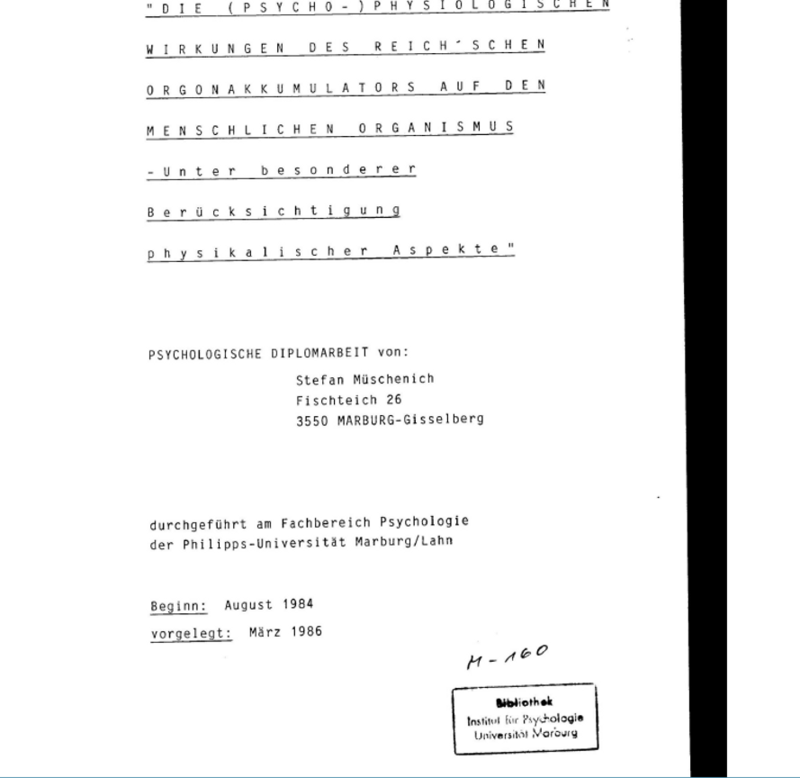 This coordinated diploma thesis is an experimental study on the (psycho-) physiological changes which occur during the course of human experimentation sessions in a Reichian Orgone accumulator. Starting from clinical observations as well as further research in the biological and physical area, the physician and psychotherapist Wilhelm R., who came from Austria, postulated a bio-energy manifesting in the organism and designated it with the term "Orgone". The basis for this was extensive biophysical studies conducted by the Reich between 1934 and 1957 at the Universities of Oslo and New York. Stages of this development were experiments on stimulus-dependent endosomatic skin-potential changes, the description of energy-bearing vesicular structures ("bions") during the microscopic observation of the decay process of biological preparations and investigations on unexplained atmospheric energy phenomena. Reich finally came to the assumption that the orgone is concerned with a specific (psycho) physiological effect on the human organism. Around 1940 Reich published the construction plans for a device in whose interior this energy can be concentrated. He claimed that a stay in this so-called "orgone accumulator" caused certain psychological and physical reactions, and later used the device for therapeutic purposes in certain pathologies. The Orgone accumulator is a box-like device whose walls each consist of a number of alternating layers of organic material (outer) and metal (inner). Comparing Orgone materials for EMF absorption. medical intuitive, energy reader, energy healer, clairvoyant, channel and teacher of intuitive development.